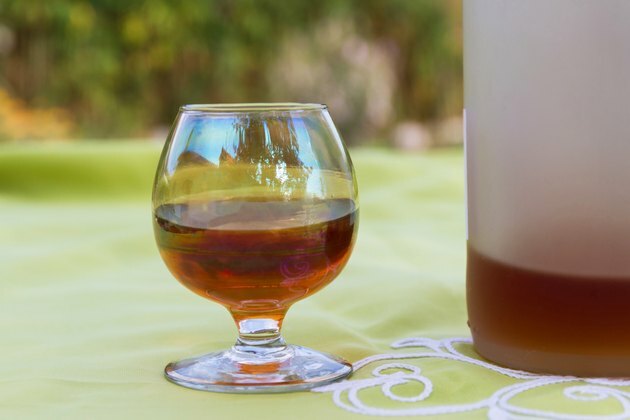 Blackberry brandy is brandy-based liqueur that has been flavored with blackberries and sugar. It can be drank by itself or incorporated into sweet cocktails. One 1 oz. serving of blackberry brandy contains 103 calories and zero fat, according to FatSecret, a nutrition website. Eleven g of carbohydrates are in 1 oz. of blackberry brandy, including 11g of sugar. According to Drinks Mixer, a beverage website, blackberry brandy contains 35 percent alcohol by volume, making it 70 proof.